with hope that is treasured in Heaven above. 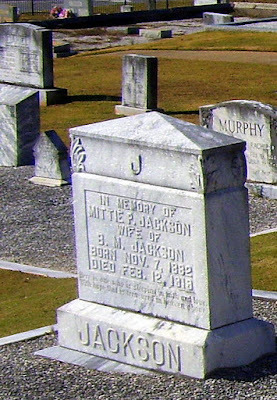 While searching for information about Mrs. Mittie Jackson, I was fortunate to find her death certificate via FamilySearch.org and the Georgia Deaths, 1914-1927 database. 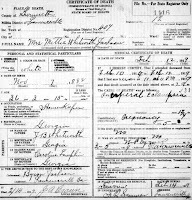 In it, her cause of death was described as "puerperal eclampsia." This condition lasted for 1 & 3/4 days, and a contributory cause was her pregnancy of five months. An online medical dictionary (with the American Heritage Medical Dictionary listed as the source) describes this condition as "Convulsions and coma that are associated with hypertension, edema, or proteinuria, occurring in a woman immediately following childbirth." All I could think of upon reading the death certificate and the subsequent definition is How awful! Mittie was only 36 years old when she died. 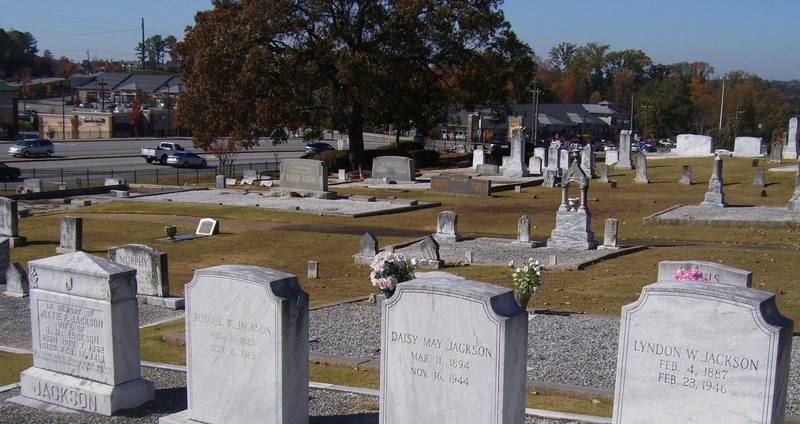 Somewhat ironically, she was laid to rest in the Fairview Presbyterian Church Cemetery on Valentine's Day, 1919. 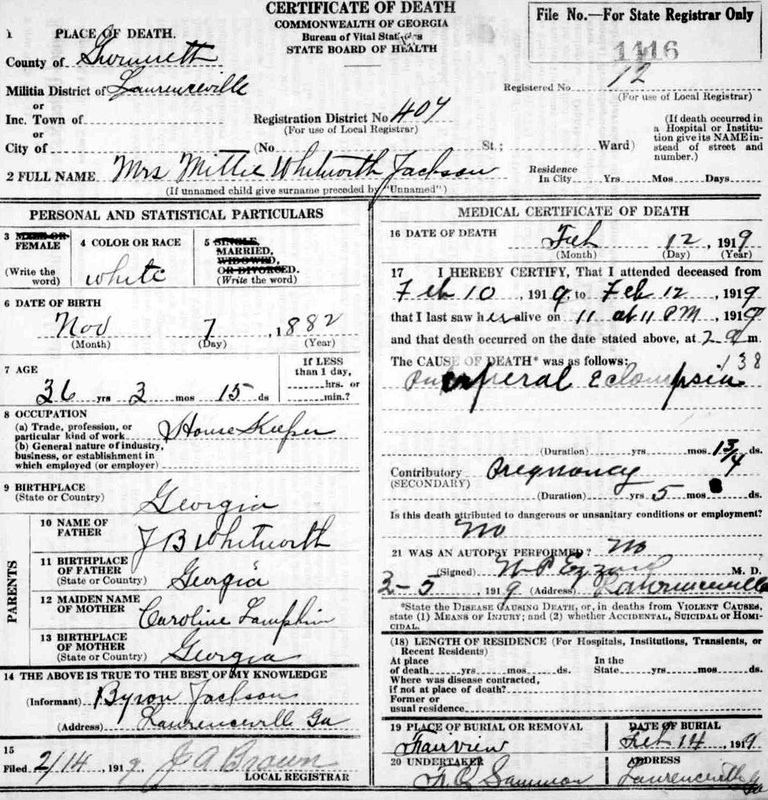 Recently, Tennessee death certificates became available on Ancestry, so I have been going through then document-by-document in order to find any that might be associated with my family. Often, I come across a cause of death such as this, post puerperal eclampsia, that I just have to look up. This one because three weeks after the mother died, the baby died and the cause of death was listed as believed to be caused by the 'same poison' as had caused the mother's death. Naturally, I had to go back looking for the mother. The poison must be the toxemia, don't you think? Your post, btw, was the one that answered my question. Sounds right to me (with my limited knowledge on the subject). I'm glad the post was informative -- thanks for stopping by! Military Monday: Corporal Archie Harris, Jr.